Yesterday Europe baked in record temperatures for July, with France Holland Belgium and Spain pushing 40C, (104F), in my back garden in North Holland in the shade yesterday peaked at 39C (102.5), which beats the previous record of 38C. Even the UK had temperatures well into the 30's. Four people were reported dead from the heat in Texas this week as America has suffered horrendous weather this summer, with record heat, flooding, tornado's mega storms and wildfires. So its not surprising that NOAA has announced, June marks 14 consecutive months of record heat for the globe. Their report claims, persistent heat on land and in the sea this June shattered records, yet again. June 2016 was 1.62 degrees F above the 20th century average, breaking last year’s record for the warmest June on record by 0.04 degrees F, according to scientists from NOAA’s National Centers for Environmental Information. 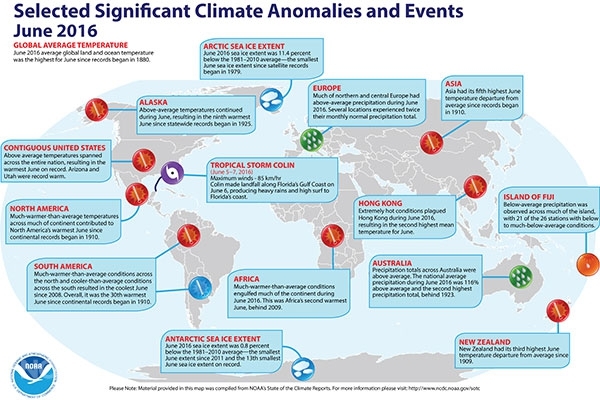 NOAA’s global temperature records dates back 137 years to 1880. For the year to date, the average global temperature was 1.89 degrees F above the 20th century average. This was the highest temperature for this period, surpassing the previous record set in 2015 by 0.36 degrees F.
The globally averaged land temperature tied as record high for June, making it the 34th consecutive June with temperatures above the 20th century average. The year-to-date (January–June) average temperature was also record high. The average Arctic sea ice extent for June was 11.4 percent below the 1981–2010 average. This was the smallest June extent since records began in 1979. The year-to-date temperature across global land and ocean surfaces was 1.89°F above the 20th century average of 56.3°F. This was the highest for January-June in the 1880–2016 record, surpassing the previous record set in 2015 by 0.36°F. The year-to-date globally averaged land surface temperature was 3.17°F above the 20th century average of 45.0°F. This was the highest for January-June in the 1880–2016 record, exceeding the previous record of 2015 by 0.70°F. The year-to-date globally averaged sea surface temperature was 1.42°F above the 20th century average of 60.9°F. This was the highest for January-June in the 1880–2016 record, besting the previous record of 2015 by 0.25°F.